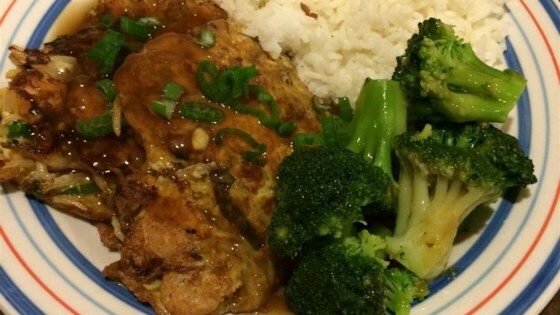 "A recipe making egg foo young patties and a delicious sauce to put on top. This is a very special recipe acquired when I worked at a Chinese restaurant to pay for my red '66 VW bug when in high school! The recipe card is tattered and spotted now, but the dish is the best egg foo young I have ever had. Hope you enjoy it too! To serve, place egg patty over steamed rice and put the sauce on top." Beat together the eggs, bean sprouts, green onions, shrimp, and garlic powder in a bowl until well-combined. Heat the oil in a skillet over medium heat, and scoop about 1/2 cup of the egg mixture into the skillet to make a patty. Fry until golden brown, about 4 minutes per side, and repeat with the remaining egg mixture. Set the patties aside. Whisk together the chicken broth, cornstarch, sugar, vinegar, and soy sauce in a saucepan over medium-low heat until the sauce simmers and thickens, about 5 minutes. Spoon the sauce over the patties. You can substitute cooked chicken or pork for the shrimp. The patties had good flavor, but the sauce, with the addition of vinegar made it sour and ruined it. I ended up using a chicken gravy. This turned out really good, I was not real crazy about the sauce, so next time will make that different, but the Egg Foo Young it's self was awesome!